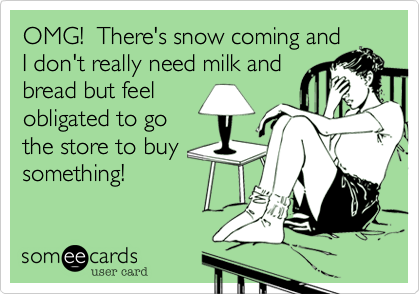 What is it about cold weather or blizzards that make people run out and stock up and milk and bread? I grew up in southwest Kansas and we would get blizzards. The kind that would knock out your electricity for days. We would have a sheet covering the doorway to the kitchen, which momma kept warm with Coleman lantrens and camp stoves (she made the best pancakes on that stove!) On the plus side, there was a bathroom right off of the kitchen so no need to leave the warmest room! Bad news though, night time....freezing bedrooms. You had to pile the blankets on top of you to stay warm! Don't even get me started on shoveling out the car. Maybe that is why momma bought milk and bread before the storm, it wasn't worth shoveling out the car to go after the storm! Fast forward today. I live in Texas so we don't get blizzards, and very few snow days. On Friday, a big cold front is coming in bringing 38 degree weather. I know, some of you are on the floor laughing saying "This is a cold front?!" But to us, it is. We are even forecasted for... gasp... freezing rain! I will say I am excited for "fall-like" temperatures especially through next week and on Thanksgiving day. Anyway, I was telling momma about our cold front and she said they were already getting theirs, and I quote, "It's a good thing I already went to the store and got bread and milk." Now I don't know about you, but I don't think you can survive on milk and bread alone. But why do you just say you need to go get those two specific items? It still boggles the mind after 20+ years. Now, when I am milk and dairy free, we have super cold weather coming and I can't have milk or bread. WHAT AM I GOING TO BUY AT THE STORE?? What replaces milk and bread? OMG we are going to starve in a southern cold front?! I almost, ALMOST, feel this panicky. Wait. The moment has passed. Back to your regularly schedule reading. Have a wonderful weekend my friends. Stay safe, stay warm, and for heaven sake buy milk and bread!! Hooking up with MaMade Diaries, Life as Mommy, and my friend Happiness is a Mood Not a Destination.